A formal request or written application that is utilized by employees to ask for leave from office is called a job leave form. Every organization big or small has certain standard operating procedures and formal processes. These may include all kinds of operations that are taking place within the company. Many organizations have large human resource departments that deal with all employee related issues and problems. They are the ones that make all the formal documentation and procedures. Whenever an employee wants to make an absence from work it is always advisable to take a proper leave of absence and get it approved from the manager. An employee may need to go somewhere or have some personal matter to deal with during working hours of the job. In some unfortunate situation, he or she might fall ill or any other accidental event might occur. He or she would then request for a leave of absence from work using the job leave form. 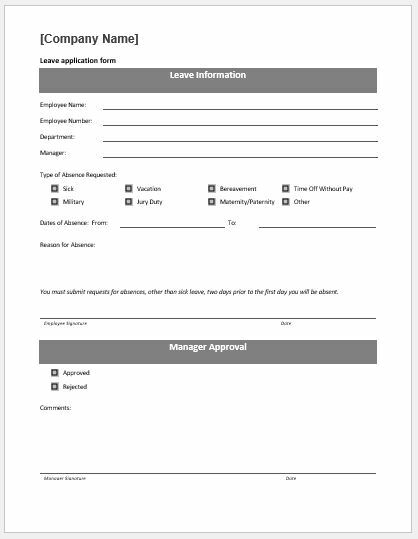 The job leave form is a formal request from an employee to the organization to grant him leave of absence from work.